The Outreach Program for Soccer is a community-based recreational program specifically designed to meet the needs of athletes ages 5 years and older with physical, cognitive, or developmental disabilities participate in the world’s most popular sport. Player participation and development are key elements of the program as players are placed on teams according to ability and not by age. TOPSoccer is designed to improve the overall fitness, self-esteem and social skills of your child. The basis of TOPSoccer is a modified version of the game of soccer, specifically altered to allow full participation and enjoyment for every athlete. TOPSoccer furthers US Youth Soccer’s mission of fostering the physical, mental and emotional growth and development of America’s youth through the sport of soccer at all levels. In short, TOPSoccer takes kids from the sidelines to participating in the game. Just talk with the parents or participants of TOPSoccer and you’ll understand why TOPSoccer? Procedures vary from club to club with an effort made to keep cost affordable to ALL. It may be necessary to provide a doctor’s permission slip in order for your child to participate. New TOPSoccer programs are starting up every season! 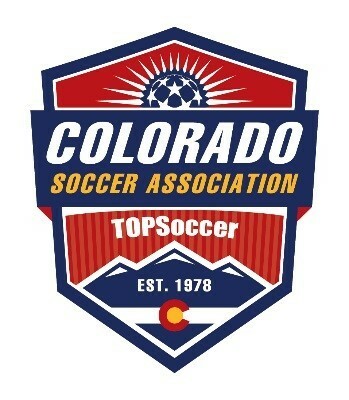 Contact Colorado Soccer TOPS State Coordinator, Cristi Thomas at 970-218-5253 or via email TOPSoccer@coloradosoccer.org to find a team near you! What is the role of the TOPSoccer parent? Provide transportation to and from all practices and games, ensuring that the player is prompt. Attend all practices and games. Lend support in a positive manner. Provide any pertinent information about your child to the coaches and administrators. What should families expect from the program? A fun and meaningful experience for you and your family. Games and activities adapted to promote your child's participation. Parents will have the opportunity to network with other families for support and information-sharing.